We don’t need to research the web to learn that, for the last 3 years, attacks on ATM(s) have caused the greatest loss of money in the history of cyber-attacks worldwide. A multinational gang of cyber-criminals infiltrated more than 100 banks across 30 countries and made off with up to one billion dollars over a period of roughly two years. A global posse of cyber thieves, armed with laptops in place of guns, hacked into financial institutions and stole $45 million from automated teller machines in a first-of-its-kind heist made for the 21st century, authorities in New York said Thursday. Over a seven-month period, authorities said, hackers broke into computer networks of financial companies in the United States and India and eliminated the withdrawal limits on prepaid debit cards. It is a reality that crime has overcome and outnumbered the police in strategy and management of technological components to commit new Cyber fraud. Today is much more profitable to “hack” an ATM than to go out and rob a bank with a mask and gun. Physical and logical security that banks have implemented no longer pose a significant safety measure. 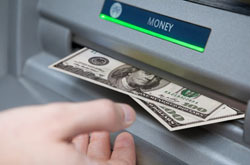 There are criminal groups that invest in buying their own ATM machines, buy software licenses from ATM supplier and then use that information to set new and better tools of fraud aimed attack the ATM’s safety. ATM Krypto Shield™ is a sophisticated solution that offers the highest level of ATM machine security. It is designed to avoid logical attacks on the operating system, ATM software system and other third party applications. ATM Krypto Shield’s™ redefying architecture adapts to today’s global ATM attacks, minimizing the risk of banking fraud from the ATM network. With over 10 years of experience in cyber security product development, with hundreds of penetration testing controls, and detail attention to all attacks on the ATM, ATM Krypto Shield™ is an ultra-high performance security solution that meets all the specifications of the largest ATM suppliers in the world. ATM Krypto Shield™ has an online monitoring tool of which banks can see in “real time” the status of their ATMs. Within seconds the bank can received alerts on anomalies, system crashes and intrusions.